Screen Printing | | Industrial Marking Services, Inc.Industrial Marking Services, Inc.
Screen Printing - Industrial Marking Services, Inc.
Screen Printing offers unmatched durability and flexibility while presenting images that are crisp, clear and colorful. The process involves laying down a thicker layer of ink coating which makes the product more resistant to the sun and other outdoor elements. It also survives the wear and tear that can be accumulated through cleaning agents and chemicals. This means that screen printed materials can thrive in challenging environments. Even after the printing process, we offer a variety of enhancements to make your product look its very best including embossing, adhesives, overlaminates, die-cutting, doming and pre-masks. We stock screens from 12 X 20 to 48 X 48 and specialize in close tolerance, 1 color or 10. And best of all? 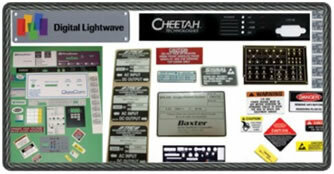 We can handle all of the ‘this can’t be done items’ including nameplates, panels, chassis, decals, labels, and lexan overlays! Call us today to find out how our screen-printing services can help you and your message stand out in the crowd!